(CNN) -- The Dalai Lama arrived in Taiwan on Sunday on a visit that will include prayers for victims of Typhoon Morakot, but which has raised the ire of neighboring China. 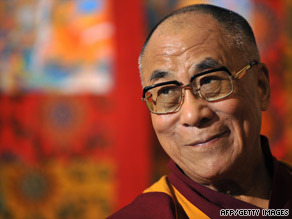 The Dalai Lama said his trip to Taiwan did not have a "political nature." The exiled Tibetan spiritual leader landed in Taipei about 10:45 p.m. (10:45 a.m. ET) after a six-hour flight from India. He was scheduled to travel immediately to southern Taiwan, where Morakot caused heavy flooding and killed more than 500 people when it struck August 8, and is expected to meet and pray with survivors of the disaster Monday afternoon. "As a Buddhist monk, it is my moral principle to go there, see them and at least share some of their sorrow, some of their sadness," he said. But his visit has angered the Chinese government, which strongly opposed the trip. The Dalai Lama said the trip did not have a "political nature." "Sometimes I have some political agenda," he told the crush of reporters who met his flight in Taipei. "Otherwise, wherever I go, no political -- only spiritual and education, and now, this time, humanitarian." The Buddhist leader is expected to give a public talk on compassion and religious harmony before returning to India on Friday, his spokesman, Tenzin Taklha, said Friday. China's state news agency Xinhua said Sunday that Beijing maintains its "resolute opposition" to the visit, which it said "is bound to have a negative influence on the relations between the mainland and Taiwan." The typhoon dumped more than 100 inches (3.3 meters) of rain on the island before moving onto the mainland. The resulting flooding and landslides killed at least 543 people, Taiwan's Central Emergency Operation Center said last week, with at least 117 more still missing. Rescuers struggled to find many of those who were missing in the island's remote southern mountains, and Taiwan's President Ma Ying-jeou has apologized last week for the government's slow response to the disaster.